It has been found that pigeons take time to acclimatise to their new environment. The best results from imported pigeons have been obtained when they have been directly mated to local pigeons. Another problem that has arisen is that pigeons imported from known short distance Belgium lofts only fiew well over the longer distances in South Africa and did not do as well as expected over the short distances here. In studying the differences in weather conditions between the two continents it has occured to me that the answer could lie in the fact that fanciers in South Africa, and especially those in the Transvaal, always organise races from a south or south westerly direction. In the Transvaal a cold front invariably comes from the south and since the short distance races are always flown during June, July and the beginning of August,which are the winter months, it follows that these races are flown at high velocities when the wind is blowing sideways or from directly behind the pigeons. In Belgium races are also flown from a south westerly direction, but due to weather conditions, it often happens that short distance races are flown against a head wind. Although these are short distance races, the distance to be flown is not the deciding factor but, rather, the time the pigeons spend on the wing. Furthermore, I am convinced that the humidity of the air also plays an important part. Belgium and parts of the Continent from whence races are flown, are close to the sea and sometimes below sea level. The result is that the oxygen content in the air is high. It also happens that races are often flown in rainy conditions or cloudy conditions when the humidity or moisture content of the air is high. For lack of a technical term to describe it and in order to explain myself better I will call this condition "thick air". In South Africa, and more especially the Transvaal and Free State, racmg takes place during the winter and spring months when the air is fairly dry, with virtually no rain. In addition, these regions are high above sea level, with the result that the oxygen content in the air is also low. I will call this condition "thin air". Further to our comments in the previous chapter concerning the wing, I would now like to deal with the practical application. I have stated that the pigeon with a wing which displays openings between the end flights will excel in the harder races with head winds. 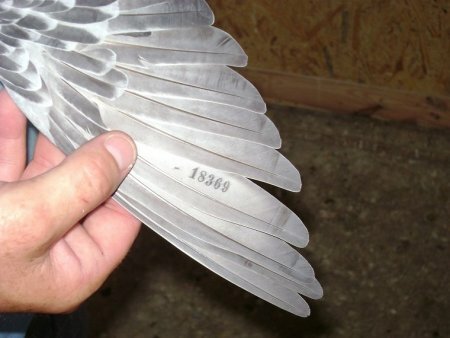 This type of pigeon will also excel in races to be flown in "thick air", as described earlier in this chapter, and, this situation will account for the pigeons winning short distance races under hard conditions with low velocities. On the other hand, pigeons which display less opening between the end flights excel in the races to be flown in "thin air" or with the wind behind them. It stands to reason that it would be easier to pull the wing down which has openings which would allow less air to be taken in, in "thick air" than to pull the wing down which has no openings and therefore allows much more air to be taken in in "thick air". The latter type of pigeon will labour heavily and will eventually give up from sheer exhaustion. On the other hand one will find that the pigeon with openings between the end flights labours in "thin air" when hè has no resistance and when every stroke of the wing only means so many more metres perminute. 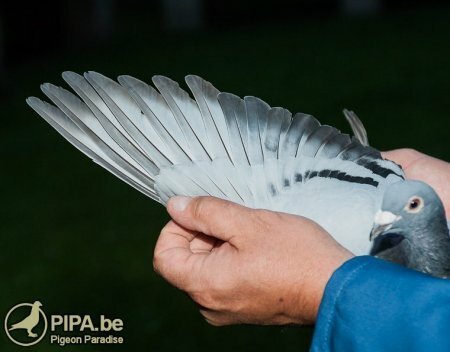 In "thin air" the position is therefore reversed and the pigeon with the openings at the end flights will become exhausted, though not as badly as the one with the closed wing in "thick air". This brings me back to the idea of short distance and long distance racing. 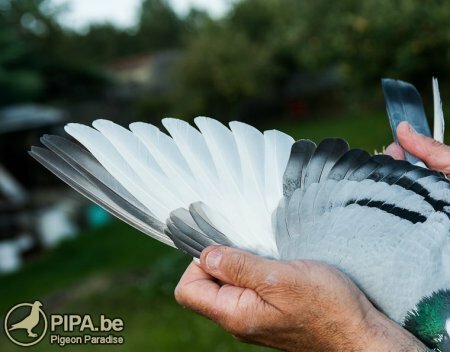 In Belgium it is possible to win short distance races with long distance pigeons which display openings at the end flights, since weather conditions are such that a short distance race could mean quite a few hours on the wing in "thick air". In South Africa and in other dry countries races are mostly flown in "thin air", with the result that pigeons there could do with less opening at the end flights. It is not strange to fly 800 km on the day or in 12 hours in South Africa and it even happens that 960 km is flown on the day. There has been a tendency among fanciers in South Africa latelv to select and breed pigeons which display much opening between the end flights. However, this could have a detrimental effect on the future of the sport. One should try rather to strike a happy medium between the two extreme types of bird. If weather conditions ever change so that races are flown in "thick air", then such a change in tendency will become essential.